Those were pretty hard frosts. 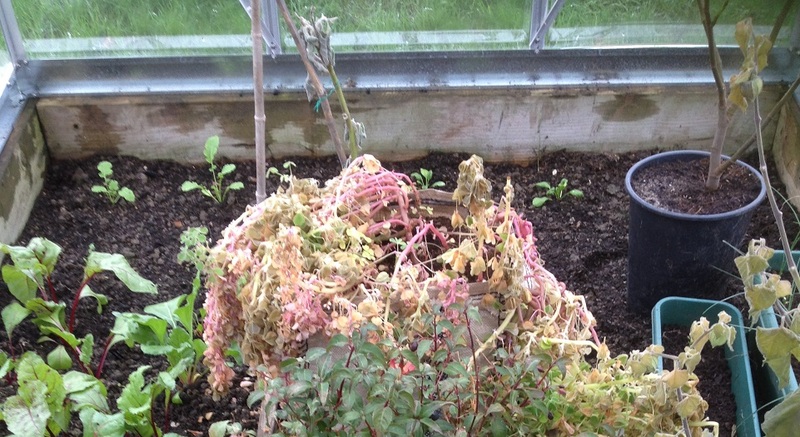 Anything that isn’t hardy has slumped, most noticeably the drifts of nasturtiums. And the oca. Last year it went down in stages, with the ‘killing frost’ around 7th December. This year it all came at once. 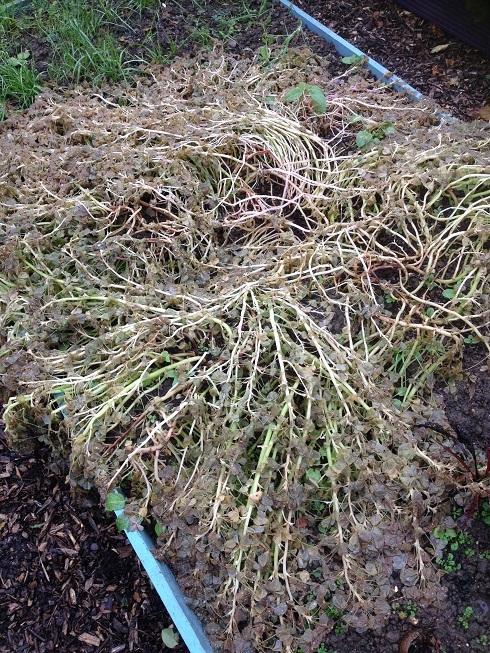 After months as pillowy heaps of lemony leaves, it’s now just sad ribs and frost-blackened bits. I had thought that the greenhouse would offer some protection, but this must have been pretty minimal. According to my (erratic) min/max thermometer temperatures in there got down to -4C on the weekend. Even allowing for its tendency to exaggerate, I’m sure it was pretty cold. There are 2-3 brave sprigs still alive but the rest is defeated. So now I have a 2-ish week wait as the tubers take in anything the plants have left and grow a bit bigger. Fingers crossed the local voles don’t sniff them out before I lift them. As always a joy to read and as I’m not a very good Andean farmer I don’t know a lot about oca anyway so need to learn…. If it’s a mountain tuber you’d expect it to be pretty tough but Marshalls (who clearly are Andean farmers at heart) say wait for 2 weeks after the lemony foliage has been frosted and the tubers evidently fatten up…. It’s always a vague worry at the back of my mind that onions demonstrate intelligence as light levels decrease and here’s another example… we are clearly not alone in this life! (And full moon tonight too, gets so complicated….) So (voles permitting) how do you use them, B? The pre-frosted foliage in salads? The fattened tubers as a boiled veg? And presumably you grow them in pots? One to try for my hard-pressed vegan friends. Do you have to buy fresh every year or propagate from saved tubers? Thank you.